New members of the Little Bigfoot gang, Scraps and Scooter. I made Scraps (the multi-colored puppy) late last night after being inspired by colorful amigurumis being posted on my facebook page. Color is wonderful! Feel free to play around with this pattern. 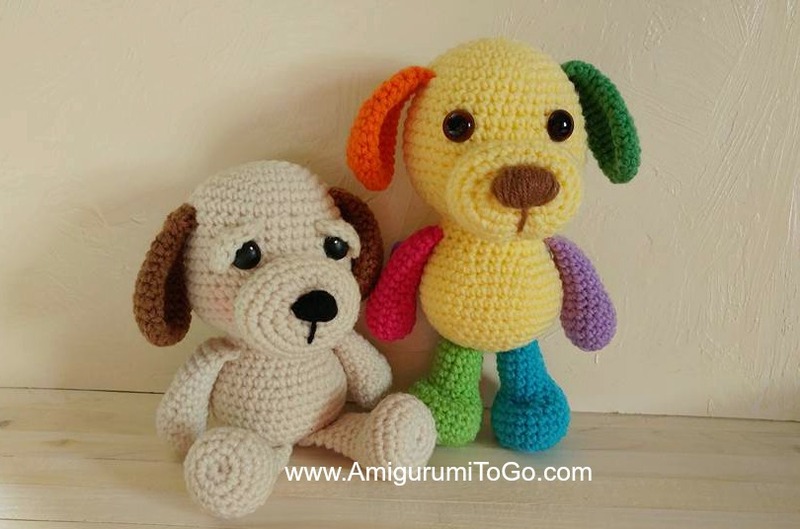 Make your puppy one solid color, multi-colored, standing or sitting. The choice is yours. Have fun! I recently released a pattern for a very large puppy here. I also released a miniature puppy here. Since then I had many requests for something in between those sizes so I came up with the Little Bigfoot Puppy. This one stands about 9 inches tall and can be worked up in a short amount of time. I have many other LBF animals in this series, see them here. They make great gifts and I've seen them used as mobiles as well. is at the bottom of this page along with the option to donate. Donating is not required but very much appreciated! Please note: when making a multi colored amigurumi sometimes parts will come out slightly different sizes when making pairs, depending on yarn color. For example: the orange ear is larger than the green ear. I had to eliminate the last row on the orange one to make it the same length as the green one. All the other parts worked out the same but just keep that in mind. Of course you can use yarn of your choice just be sure to choose the appropriate hook size. EYES: Placements are up to you since it's personal preference. I put this puppy's eyes in between the 11th and 12th row with 5 visible stitch holes between them. * Stuff majority of head. Push the stuffing to the top of the head then make sure to get stuffing all around the sides of the face and neck area. Shape as you stuff. It will take lots of stuffing. You will stuff more in a few more rows. *Stuff the body.. make sure to fill in any gaps in the neck area. Also be sure to get all around the bottom of the belly. The belly should be nice and fat. How to stitch the nose in is on the assembly page. 15) Do not stuff ear. fold ear flat and sc through both sides across. If you want a puppy that sits then leave the last 3 rows of the legs unstuffed and then continue onto row 16. If you want a puppy that is in a permanent standing position, then stuff the entire leg and f/o now leaving a long tail for sewing. 1) ch6 *starting tail should be long enough to sew into head. *stuff as you go, leaving the last 2 or 3 rows unstuffed. 11) fold top of tail flat and sc through both sides across. Thank you. Yet again, another adorable pattern. You are very talented. The expressions on your characters are wonderful. Your patterns are so easy to follow and I have made lots of them to give away for donations to various charities. Thank you so much for this amazing little pattern,Super easy to understand (And i'm only 12) I have used the pattern to make a little comfort blanket (A little blanket with the head of an animal in the middle). I love your work and have made multiple things of yours and I really appreciate the time you put into creating these patterns. Thank you for all your little Bigfoot instructions. I enjoy making my grandkids happy.